In addition to all the features of a real caliper, FRACTIONAL CALIPER is the only one capable of performing at the same time converting mm to inches and fractions of inch. Caliper and converter all in one! 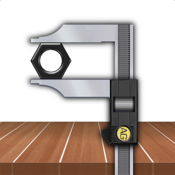 It is extremely easy to use by anyone, at home, in the garage, shopping ... And it is also the perfect tool for professionals, thanks its quick feature recognition of usual measures, mm and fractions of inch. - Intuitive user interface. No training required, simply slide the tool with your finger. - Units converter: inches, fractional inch and mm. - Recognition feature usual measures in fractions of inch (1/16, 1/8, 3/16, 1/4, 5/16, 3/8, 7/16, 1/2, 9/16, 5/8, 11/16, 3/4, 13/16, 7/8, 15/16), and 0.5 mm. to metric. - Fine adjustment to get higher accuracy. - Range: 70 mm. for iPhone 5 and 64mm. for iPhone 4. - Backlighting for measurement zone. - HD and optimized for iPhone 5.